This is a family oriented property. 120 Steps to the Atlantic Ocean! LOCATION, LOCATION, LOCATION ITDOES MATTER! Everything you'll need for a relaxing vacation. Immaculate reversed living home serviced by a full three stop elevator. Why climb steps when you can use the elevator? It makes packing and unpacking a breeze too! By using the elevator in the foyer, it allows someone with a disability access. 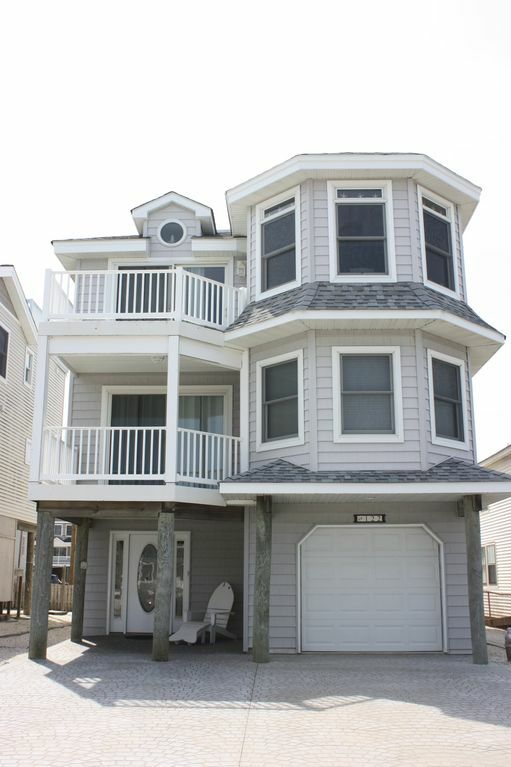 The Castle features four bedrooms (two MASTER SUITES & one JUNIOR MASTER), 3.5 tiled bathrooms, and five multi level decks, great for soaking up the sun, or enjoying the sound and smell of the ocean. Every amenity included when custom designing this house for vacationers! Come stay at 'The Castle' and feel like a king and queen. Third level hosts a stunning great room. It includes vaulted ceilings and ocean views. 46' Sony TV with Blue Ray Disc Player in great room. Dinners and entertaining will be a breeze in the gourmet tiled, fully-equipped, washed oak kitchen with breakfast island. The turret offers a large dining area with ocean views, total seating for 12. Large open living is a masterpiece of design and execution for entertaining or relaxing! Private master suite on third level offers a king bed, TV, dvd player, private bath with two person jetted tub, ceiling fan, and private sundeck. Second level - Classy family room with TV, leather sofa & covered deck overlooking the happenings of the street. This level hosts three bedrooms: roomy MASTER SUITE w/handicap assessible private bath, queen deluxe bed, sitting area and TV; JR. MASTER SUITE bedroom has queen-size deluxe bed, TV, and own private deck; third bedroom hosts One Full bed with ONE set of bunk beds and a TV. In addition, this floor features another FULL, flip flop themed BATH. For your convenience a washer and dryer is located adjacent to all rooms on the level. Exterior-Outside shower and dressing room located in the rear of the property. Enjoy the afternoon sun sitting on the one of many fiberglass decks. Roof top deck with ocean and bay views too! One car garage if you want to store your vehicle inside. Beach chairs, toys, badges and extra small refrigerator in garage are included too! Come share our home and feel like royalty! Beach, shopping, restaurants, and refreshments! NO NEED TO SIT IN TRAFFIC. Let your vacation start as soon as you enter Long Beach Island. The location makes for easy access on and off the island. Perfect for big family, or several families wanting to vacation together! Traveling with parents that would prefer an elevator over steps, well The Castle has that too! Come see why it is convenient, comfortable, yet a property of distinction! Coming for a wedding at Bonnet Island, Mallard Island Yacht Club, Surf City Yacht Club, Branch Beach Yacht Club or any venue on LBI... Home located within minutes to each. The CASTLE is a great place for the extended family and friends to gather. We came to 14th Street in 1985, and never left. The location offers quick access to the beach, yet close to the Causeway Bridge too. Take advantage of this home FOURTH from the beach. See The ocean from the decks. Enjoy meals while gazing out at the ocean. (5) Layers of decks for ocean viewing and watching sunsets. Top roof top deck.. soak up the warm sun..
Full sevice Elevator, Central Air Conditioning, 1-46' Sony Flat Screen TV,1-42' Flat Screen TV4-32' Flat Screen TVs in all bedrooms, BOSE Stereo, Full Gourmet Kitchen, Island, Breakfast Bar, Corian Counter Tops, Separate Ice Maker, Five Decks, Roof-Top Deck, Outside Shower & Dressing Room, Weber Gas Grill, BEACH BADGES & beach chairs, NO Smoking and NO Pets! My only complaint is that we couldn't stay longer. Stayed at "the castle" with 9 lifelong friends and had a great time visiting the beach, the local landmarks, and the nearby restaurants. Big thumbs up! We had a wonderful time. The house was immaculate, had plenty of room, and was easy to get to. Just a short walk to the beach! The owners were wonderful to work with. Highly recommend this place. Just returned from a wonderful trip to the castle. This home is located just a few doors down to the beach. We had 2 families of 4 for a total of 8 people and had plenty of room for everyone. There were plenty of beach chairs and toys for the kids to use daily and all the amenities one would need to have a wonderful vacation. The house was very clean upon arrival and Sherry really thought of everything that made our stay a stress free one. And when we returned home Sherry reached out to let us know she found our child's blanket which she promptly sent back along with our security deposit. A+ service all around. Thanks Sherry! Another great vacation at The Castle, just as wonderful as last year! Our family really enjoyed ourselves, my sister's two-year old twin grandchildren provided us with much laughter and love. The second week was a real scorcher, but the air conditioning kept us comfortably cool. Again, The Castle is just a beautifully furnished and equipped home. We were so glad Sandy did not visit!!! My family and I stayed at "The Castle" the week of my wedding. It was very spacious and clean, the house exceeded our expectations. There was plenty of room for all of us that we were never jammed together. The views were amazing, especially the rooftop deck. It was also great to have an elevator, but, not for using instead of the stairs, for loading the groceries, luggage and wedding supplies. It was definitely a bonus! The owner was wonderful to work with. She was very accommodating and friendly. We would highly recommend staying here and would definitely stay here again! We had a great two weeks at The Castle, the weather was great and we actually walked to the Bayberry! Th elevator was wonderful for me, a disabled person, and with the handicapped ramp at the end of your street, I was able to take my scooter up and watch the ocean. Youe house is beautifully furnished and well-equipped; we will have great memories of staying there. Steps to the Atlantic for swimming, relaxing, or reading a good book, Tennis Courts, Minature Golf, fine dining, and shops, all within walking distance, 20 Minutes to golf courses and less than an hour to Atlantic City Casinos.Easy on/off access of Island too. LOCATION, LOCATION, LOCATION! See above for rates. Weekends are available except for In Season Time. Email me your requests. $1000 Security Deposit is required. Thank you for viewing my site and considering "The Castle." Please no Prom or High School Groups!